I adore fresh, raw milk, and once I believed that I'd some day own a milk goat. But the infrastructure demands are just too high --- pasture, high security fences, neighbors willing to milk morning and evening when we're away. I'm not ruling out dairy animals forever, just for the foreseeable future. But, as Mark likes to say, "Anna gets what she wants." He's been networking, trying to hunt down someone who'd sell us raw milk. Given the legal situation, I understand it's a lot like trying to find a drug dealer. 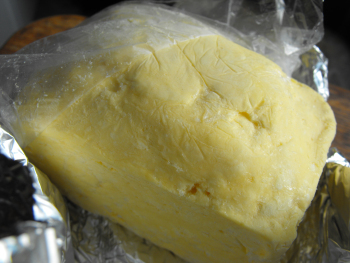 Last week, we got a little nibble --- someone willing to sell us fresh, homemade butter. I hope the butter will be like a foot in the door toward milk. Meanwhile, I just read in Mother Earth News that butter from pastured cows is highest in vitamins at this time of year. Just like the yolks from pastured poultry eggs, butter from summer pastured cows is yellower and considered a premium product. So we plan to stock up and sock summer butter away in the freezer to feed us through the long, hard winter. Our friends figured out a way to get unpasteurized milk. They found a farmer that was willing to let them "buy" a cow from him. Several people went in to pay the farmer for this cow, but the farmer takes care of said cow. Since our friends "own" this cow, they take the milk without pasteurizing it. Since they "own" the cow, no one can tell them what to do with the milk from their cow. As for getting fresh milk, what if YOU became the neighbor that was willing to milk when someone was on vacation? You'd get experience benifit from seeing how others raise their dairy animals, and get entree into the world of fresh milk. Long ago, I was a high school kid who liked to house sit, and some of my regular customers had goats. It was hard for them to find someone who knew how to milk. Just a thought. Laura and Tracy --- such great suggestions! We may try both!